Lake Honrich is a lake in the eastern Rift, immediately southwest of Riften. It is drained by the Treva River and was named Lake Honnith in the First Era. Goldenglow Estate occupies a cluster of islands in the middle of the lake. 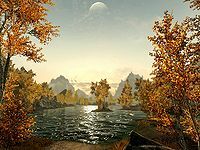 Lake Honrich is a popular spot for fishermen across Skyrim and it even has a fishery found on its eastern shores in Riften.